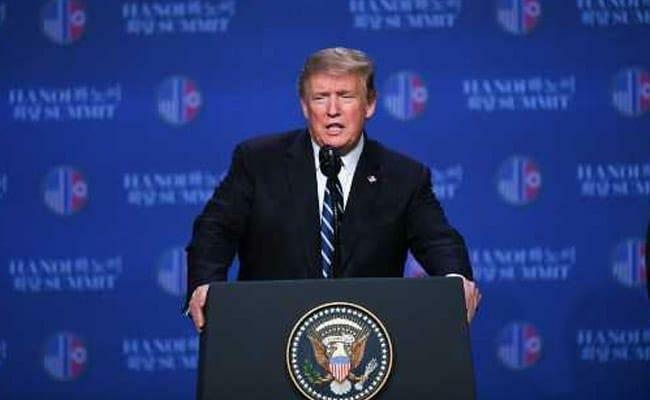 President Donald Trump Thursday voiced confidence that the hostilities between India and Pakistan would end soon, saying he has some "reasonably decent" news with the US involved in trying to help reduce tensions between the two nuclear-armed neighbours. In his opening statement at a press conference at the end of his second summit with North Korean leader Kim Jong-un here, Trump said the US has some "reasonably attractive news" from Pakistan and India. "We have been involved in trying to help them (India and Pakistan) stop and we have some reasonably decent news," he told the reporters. "I think hopefully that (tensions) could be coming to an end, it has been going on for a long time," Trump said. Tensions have escalated between India and Pakistan in the wake of the Pulwama attack by Pakistan-based Jaish-e-Mohammed (JeM). The US president said that there is a lot of "dislike" (between India and Pakistan). India carried out air strikes against the biggest training camp of JeM in Balakot. In the operation, a very large number of JeM terrorists, trainers, senior commanders and groups of jihadis who were being trained for suicide attacks were eliminated. The facility at Balakot was headed by Yousuf Azhar, the brother-in-law of the JeM chief. Pakistan on Wednesday claimed it shot down two Indian fighter jets over Pakistani air space and arrested a pilot. Forty CRPF personnel were killed and many injured on February 14 in one of the deadliest terror attacks in Jammu and Kashmir when a JeM suicide bomber rammed a vehicle carrying over 100 kg of explosives into their bus in Pulwama district. ভাৰত আৰু চীন সংঘাত অনিবার্য?